I sat staring at the blank page wondering if I was brave enough to begin. It would have been easy to just close up the book and take a quiet walk in the early April breeze. But something stirred inside of me, waking up feelings that had been dormant for too long. Every moment of the weekend had been a risk for me -- the saying yes, the six hour drive across Pennsylvania alone, the roommate I had never met. But for every hesitation, I felt the assurance that this was where I needed to be. I listened to Christine share her story, of how God pulled her out of the darkness through art. And how the Creator, making us in His image, put creativity in each of us. I had always said I wasn't an artist, but Christine challenged that. She taught us to look at art as an expression of worship. I picked up the purple watercolor crayon and wrote out words my heart needed to see. I glued down "The Old Rugged Cross" and spread color around it with my finger. I reflected, prayed, and cried over the words I wrote across the page. The creative above is my friend, Christine Hiester, and she is a talented artist who inspired me to make art a part of my life. Her "no rules" approach and creative encouragement gave me the courage to try and continue. 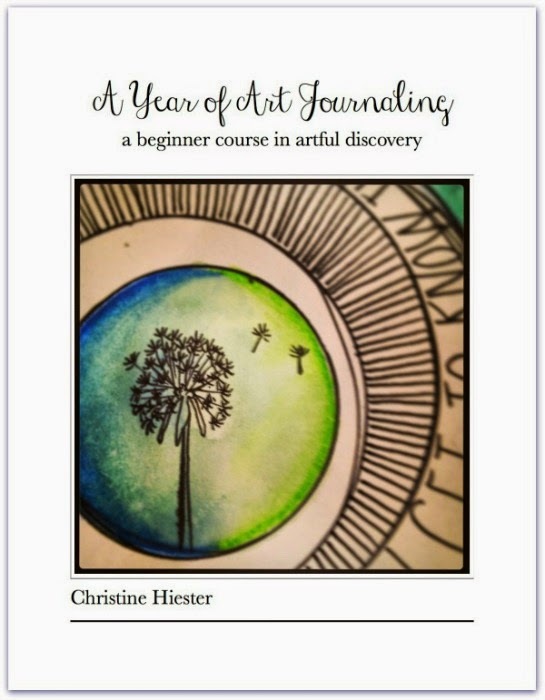 On Monday, she released an ebook, "A Year of Art Journaling: A Beginner Course in Artful Discovery". If you are curious about art journaling or exploring worship through art, or if you have been dabbling in art journaling and are looking for encouragement and some examples of techniques, I would highly recommend checking this out. Through the process of finishing my first art journal page I realized how often I squelch my creativity. How the long list of chores and responsibilities trump making time for art. I don't want to do that anymore. There's something sacred about creating. Ideas born and courageously expressed, surrendering fears and self-doubts and perfectionism with every streak of color, every stroke of the paint brush. Uncovering creativity is uncovering you -- a discovery worthy of your time. Love this, Christy! Both the message and the art. I can feel I too often squelch my creativity, but I don't want to do that anymore either. Thank you, Christine & Judy!